FC Barcelona presented today its annual accounts for the 2017/18 season and the budget for the 2018/19 season, which, on October 20th, will be submitted for approval to the Ordinary General Assembly of Member Delegates. The Vice President and Treasurer of the Board of Directors, Enric Tombas, detailed the economic report on the fiscal year 2017/18 season, which ended on June 30 with revenue of $1.05bn (€914m), and makes FC Barcelona the first sports club in the world to surpass the 1 billion dollar mark in revenues. 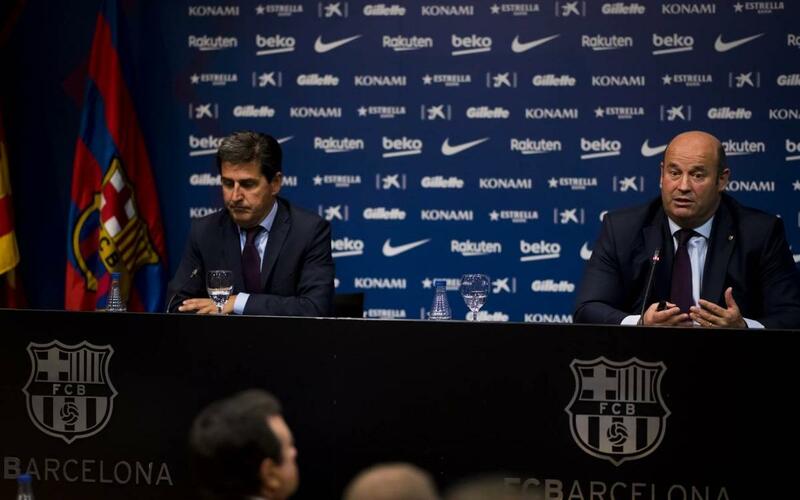 The club's CEO, Oscar Grau, presented the budget for the 2018/19 season, which foresees revenue of $1.105bn (€960m), a figure which strengthens Barça’s position as the highest earning sports club in the world. This is undoubtedly an extraordinary achievement in the Club's history, in line with its Strategic Plan to reach revenue of €1bn by 2021, the final year of the current Board's mandate. The budget of $1.105bn (€960m) exceeds the $1.05bn (€914m) in revenue at the end of 2017/18 and published on July 16, following approval by the Board of Directors. This is the first time that revenue has surpassed $1bn, a huge step up from 2016/17. The budget presents an after-tax profit of $12.67m (€11m), and since 2010, the accumulated profits amount to $229m (€199m), thereby closing the eighth consecutive year with a profit. The budget reports a record EBITDA of $220m (€191m), an historical record which confirms the economic strength of the Club and its long term sustainability. Regarding the investments budgeted for the 2018/19 season, there are $83m (€72m) for the Espai Barça project. Another aspect to highlight from this budget is the reduction in club's wage bill for its players, which is down 4 points compared to last season and represents 66% of total revenue. In addition, without the cost of the wages paid to athletes in other professional sports, the figure would be around 61%, below the threshold recommended by UEFA. The extraordinary income from payment of Neymar Jr's buyout clause has been compensated in next year’s budget through improved commercial and sponsorship revenue, media rights, stadium revenues and transfers of players. An increase in the merchandising business is expected following consolidation of Barça Licensing & Merchandising (BLM), the company that the Club created to regain management of Barça stores and licensed products. The other significant item that helps to explain the increase in revenue is media, thanks to the new cycle for the distribution of UEFA payments for the Champions League. The Board's assessment of the evolution of the club's finances is very positive, not only because of the increase in revenue, which is based on the targets set out in its Strategic Plan to reach $1.15bn (€1bn) by 2021, but also because it is in keeping with the basic principles that underpin the way this board manages the club. The EBITDA ratio has remained within the limits of financial balance set out by the club statutes. With regard to the closure of accounts corresponding to the 2017/18 season, the Club has achieved its highest revenue ever, S1.05bn (€914m), which is $20m (€17m) higher than the budgeted figure of $1.03bn (€897m). This is the fifth consecutive year in which the Club has broken its own record income and the first time that FC Barcelona has surpassed $1bn in revenue. Expenses amount to $1.017bn (€882m), so the operating profits are $37m (€32m) and the after-tax profit is $15m (€13m). Accumulated profits since 2010 amount to $217m (€188m), making this the eighth consecutive year of clean audits, without exception. EBITDA has been set at $204m (€177m). The club’s debt on June 30th 2018 amounted to $181.3m (€157.4m). In order to comply with equity balance, the debt/EBITDA ratio, discounting investments in the Espai Barça project is 0.68 under the maximum limit, set this year at 2. Equity was negative -$71m (-€62m) as of 30 June 2010, while by 30 June 2018 it was positive at $147m (€128m). NOTE: All amounts described in the release are in USD and (Euro).